The advancement requirement of agendas installed in this server is lowered by 1. "I hear the coast is nice this time of year." "If you're in the right business, it's nice all the year." SanSan City Grid... Core Set, Splashable, and the heart of both NEH FA, and HB FA, along with Biotic labour. And yes, they are comparable. Biotic Labour: 7 credits and 1 turn to score 3 advancement agenda in . SanSan: 8 credits and 1 turn to score 3 advancement agenda. So SanSan is worse... except it isn't. It has a lower influence cost, and can be used more than once, allowing you to FA multiple agendas in a server, countering the strategy people use for Biotic Labour - R&D lock. With SanSan City Grid, you don't need to protect R&D as much, leaving more ICE on Anti-Account Siphon duty. "But it's an asset", I hear you cry, "It can be trashed." But is it being an asset negative. Sure, it can be trashed, and the the runner is down 6c, and your scoring server is now impenetrable. The solutions for dealing with Biotics still work on it, but SanSan can cause the runner to drop everything to trash it, overreacting to an expensive, but effective, card. 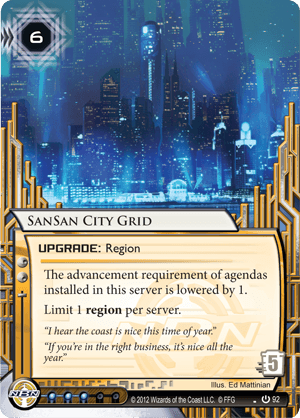 Overall, SanSan City Grid is an Autoinclude in an NBN FA deck, a probable include in other FA decks, and a decent all-round card for use in FA, making it one of the easier deck-building choices. This is one of the worst cards every printed. It's incredibly expensive, and the economic benefit it gives you simply isn't good enough to compensate. This card saves you 1 per agenda you score. Let's assume you're mostly scoring 2-pointers. Then you need 4 agendas to win, so this card saves you at most 4 over the course of a game. Well, you paid 6 to rez it in the first place, so you used a click to throw 2 directly into the trash. This card is simply a trap for new players who like the color blue.